If you or a family member was hit by a car, you need an experienced personal injury lawyer on your side. 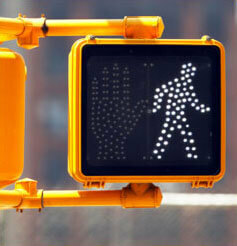 Pedestrian accidents usually involve very serious injuries. You will need compensation to cover medical bills and other costs. At Dixon Law Office, my staff and I help accident victims recover the compensation necessary to heal and move forward with their lives. We have extensive experience with pedestrian accident cases involving catastrophic injury and wrongful death. You can rely on our dedication to getting results. For a free consultation with a personal injury lawyer, please call (888) 354-9880 or contact us online. Children are often victims of pedestrian accidents. They may suffer catastrophic injuries to the brain, spine, arms and legs, and internal organs. When the injuries are this serious, wrongful death may also occur. Our goal is to recover compensation to cover your medical bills, long-term care, lost wages, pain and suffering, and other related expenses. In wrongful death cases, we can seek additional damages for funeral expenses and emotional trauma to the survivors. Please call our office at (888) 354-9880 to schedule an appointment with our Cook County pedestrian accident attorney.